February 27 Monday: Ash Monday Penitential Service (50 Days Fast Begins). Day of Obligation and fasting. April 9 Sunday: Palm Sunday. No Religious Education Class. April 14 Friday: Good Friday Passion Service at 5:00 P.M.
April 15 Saturday: Great Saturday. Holy Mass at 10:00 A.M.
April 16 Sunday: Easter Holy Mass at 10:00 A.M. No other mass today. May 27 Saturday: First Holy Communion of Sacred Heart at 3:00 P.M.
May 28 Sunday: First Holy Communion of St. Mary's. July 3 Monday: Dukhrana of St. Thomas Day of Obligation. 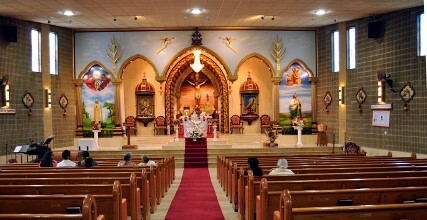 Holy Mass at 10:00 A.M.
August 13 Sunday: Parish Main Feast. 10:00 A.M. Rasa and Procession. No evening mass. November 2 Thursday: Commemoratoin of the Dead. Holy Mass at 10:00 A.M. Prayer at Cemetery. No evening Mass. November 5: Sunday: Day light saving time ends. All Saints day celebration. December 17 Sunday: Christmas Celebration of Religious Education School. December 31 Sunday: Year End Service and adoration. No mass at 5:30 P.M.